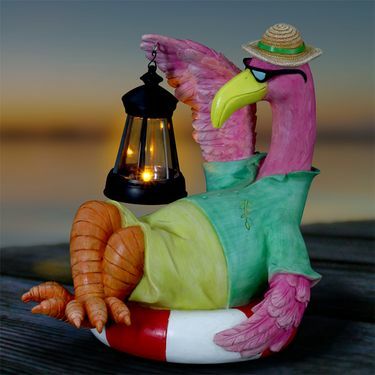 Our illuminating funky flamingo statue adds a fun and tropical touch to your garden. Watch as the solar LED light automatically glows from within his lantern at dusk. Solar powered LED light automatically glows at dusk! Made of durable resin, UV treated to resist fading. Size: 8" x 11" x 11"H., approx. 5 lbs.